Pregnancy induces profound changes in the mother, resulting in significant alterations in normal physiology. The anatomical and functional changes affect the respiratory and cardiovascular systems. Management of respiratory diseases in pregnancy requires an understanding of these changes for interpretation of clinical and laboratory manifestations of disease states. An image depicting asthma consensus guidelines to manage chronic asthma can be seen below. Pulmonary disease and pregnancy. The graph depicts asthma consensus guidelines to manage chronic asthma. These guidelines are also generally used to treat pregnant patients with asthma. The enlarging uterus and the hormonal effects produce anatomical changes to the thoracic cage. As the uterus expands, the diaphragm is displaced cephalad by as much as 4 cm; the anteroposterior and transverse diameter of the thorax increases, which enlarges chest wall circumference. Diaphragm function remains normal, and diaphragmatic excursion is not reduced. Anatomical changes to the thorax produce a progressive decrease in functional residual capacity, which is reduced 10-20% by term. The residual volume can decrease slightly during pregnancy, but this finding is not consistent; decreased expiratory reserve volume definitely changes. The increased circumference of the thoracic cage allows the vital capacity to remain unchanged, and the total lung capacity decreases only minimally by term. Hormonal changes do not significantly affect airway function. Pregnancy does not appear to change lung compliance, but chest wall and total respiratory compliance are reduced at term. The minute ventilation increases significantly, beginning in the first trimester and reaching 20-40% above baseline at term. Alveolar ventilation increases by 50-70%. The increase in ventilation occurs because of increased metabolic carbon dioxide production and because of increased respiratory drive due to the high serum progesterone level. The tidal volume increases by 30-35%. The respiratory rate remains relatively constant or increases slightly. Physiological hyperventilation results in respiratory alkalosis with compensatory renal excretion of bicarbonate. The arterial carbon dioxide pressure reaches a plasma level of 28-32 mm Hg, and bicarbonate is decreased to 18-21 mmol/L, maintaining an arterial pH in the range of 7.40-7.47. Mild hypoxemia might occur when the patient is in the supine position. Oxygen consumption increases at the beginning of the first trimester and increases by 20-33% by term because of fetal demands and increased maternal metabolic processes. In active labor, hyperventilation increases and tachypnea caused by pain and anxiety might result in marked hypocapnia and respiratory alkalosis, adversely affecting fetal oxygenation by reducing uterine blood flow. In some patients, severe pain and anxiety can lead to rapid shallow breathing with alveolar hypoventilation, atelectasis, and mild hypoxemia. Cardiovascular changes begin in the first trimester of pregnancy and continue into the postpartum period. Maternal blood volume increases progressively, peaking at a value of approximately 40% above baseline by the third trimester. Plasma volume increases by 45-50%, and red cell mass increases by 20-30%, resulting in anemia of pregnancy. The increased blood volume is associated with elevated cardiac output, which increases by 30-50% above baseline levels by 25 weeks. The heart rate increases and reaches a maximal value of 10-30% above baseline values by 32 weeks. Systemic blood pressure decreases slightly during pregnancy, with the diastolic pressure falling approximately 10-20% and reaching a nadir at 28 weeks. Plasma colloid oncotic pressure decreases because of the dilution of plasma proteins; the critical pulmonary capillary pressure at which pulmonary edema forms also decreases. Systemic vascular resistance and pulmonary vascular resistance decrease by 20-30%. The left atrial size increases, correlating with the change in blood volume; left ventricular end-diastolic dimension increases; and left ventricular end-systolic dimension might decrease somewhat as a result of changes in cardiac contractility. The left ventricular wall thickness increases by 28%, and the left ventricular mass increases by 52%. Near term, the enlarged uterus can compress surrounding vascular structures, resulting in a decrease in venous return and stroke volume and a decrease in cardiac output. Placing the patient in the left lateral position can reduce these effects. The hemodynamic changes are most striking during labor and immediately postpartum. Cardiac output normally increases during labor by 10-15% above third trimester levels. Uterine contractions result in increased preload due to autotransfusion of 300-500 mL of blood immediately postpartum. A further increase in blood volume occurs due to the contracted uterus. Oxygen delivered to the placenta and fetus is dependent on maternal arterial oxygen content and uterine blood flow. Any decrease in maternal cardiac output can adversely affect fetal oxygenation. Maternal hypotension and endogenous catecholamines may constrict the uterine artery, decreasing blood flow to the fetus. This can also be caused by maternal alkalosis. The umbilical vein PaO2 rarely exceeds 40 mm Hg, but the fetal oxygen content is relatively high. This is largely due to the marked left shift of the oxygen dissociation curve of fetal hemoglobin, which is 80-90% saturated at a PaO2 of 30-35 mm Hg. The oxygenated umbilical vein blood mixes with deoxygenated blood in the fetal inferior vena cava, decreasing fetal arterial PaO2 to 20-25 mm Hg. The fetus has a high hemoglobin concentration (150 g/L) and an increased systemic cardiac output, and both the left ventricle and the right ventricle (via ductus arteriosus) supply the systemic circulation. Small changes in maternal PaO2 can cause large changes in fetal oxygen saturation because the fetus is operating on the steep portion of the oxygen dissociation curve. When medication is prescribed to a pregnant woman, physicians must consider the mother's pharmacological mechanisms and the well-being of the fetus, which, in many circumstances, is also affected by the medication. The ability of compounds to cross the placenta is determined by the molecular weight, electrochemical charge, and lipid solubility of the agent. The drugs, facilitated by passive diffusion or active transport, traverse the placenta and reach the fetus. While assessing potential drug effects on the fetus, evaluate the total exposure to the drug and its metabolites because a significant proportion of the drug bypasses the fetal liver. Both the rate of gastric emptying and the rate of gastric motility are decreased in the gravid patient; therefore, absorption properties are usually altered. The decreased intestinal motility can favor increased absorption. First-pass metabolism by the portal circulation is unchanged in pregnancy. The distribution of a drug is affected by the rate of perfusion of blood to the individual organs, lipid solubility, and the degree of binding to the proteins or tissue receptors. Because the physiologic volume of distribution is larger in pregnancy, high loading doses of the drug might be needed. During pregnancy, plasma protein binding usually decreases. This can cause higher circulating levels of free drug when normally protein-bound medication is administered. The clearance of drugs via direct extraction by the liver is not altered; however, pregnancy can increase the hepatic metabolism of certain drugs, resulting in a decrease in plasma concentration. Because the glomerular filtration rate increases during gestation, drugs primarily eliminated by renal excretion are cleared more rapidly during pregnancy. What animal or human data are available to assess the effect of the drug on the fetus? What is the effect of the drug on the pregnancy, including labor and delivery? Does the dose or dosing interval of the drug need to be altered because of the pregnancy? Is therapy unnecessarily modified or delayed because of the pregnancy? Unless very clear data demonstrate safety, assume that an unknown fetal effect exists. However, not prescribing necessary drugs can cause great harm to both the mother and fetus. Similar principles apply to determining drug use during breastfeeding. Although the total amount of drug ingested and absorbed by the infant is relatively small, it might produce significant effects. Both theophylline and aminophylline readily cross the placenta, but no fetal ill effects or malformations have been reported. Theophylline pharmacokinetics are unaffected by pregnancy, and this drug also appears in breast milk. These have little systemic absorption and a more potent bronchodilatory effect via inhalation. Data on the use of inhaled beta-agonists showed no difference in perinatal mortality, congenital malformations, birth weight, or Apgar scores. Prednisone has been used extensively during pregnancy for a variety of conditions. It is associated with an increased incidence of cleft palates in animals but not in humans. Neither of these medications has been associated with adverse fetal outcomes. Patients frequently request these medications for nasal symptoms, mucosal edema, and hyperemia that accompany normal pregnancy. The available data does not indicate safety of antihistamines in pregnancy. Brompheniramine is associated with congenital malformations. The major antibiotics considered safe during pregnancy are penicillin, cephalosporins, and erythromycin. Although penicillin and ampicillin readily cross the placenta, no adverse effects to the fetus are reported. Cephalosporins also traverse the placenta to a moderate degree, but no adverse fetal effects occur. Erythromycin crosses the placenta to a low degree but achieves high levels in breast milk. The estolate formulation is contraindicated due to potential hepatic toxicity in the mother. Antibiotics that have relative contraindications include sulfonamides, trimethoprim, aminoglycosides, nitrofurantoin, antituberculosis drugs, tetracyclines, and quinolones. These drugs include iodine-containing compounds. Brompheniramine, antihistamine, coumarin, and anticoagulants cause various teratogenic effects. Ciprofloxacin, sulfonamides, tetracyclines, chloramphenicol, streptomycin, and rifampin have been associated with various effects. Ionizing radiation exposure to the fetus is associated with growth retardation, CNS effects, microcephaly, and eye malformations. Maternal radiation exposure of less than 0.05 Gy is associated with no adverse effects, a dose of 0.05-0.1 Gy is considered the gray zone, and exposure to more than 0.1 Gy is associated with significant fetal effects. Fetal ionizing radiation might cause increases in childhood leukemia. A chest radiograph results in 0.002-Gy exposure; perfusion lung scan, 0.002 Gy; ventilation lung scan, 0.004 Gy; pulmonary angiography, 0.004 Gy; and venography, 0.004 Gy. Clinical presentation usually involves a sudden onset of severe dyspnea, hypoxemia, and cardiovascular collapse. Less common presentations are hemorrhage caused by disseminated intravascular coagulation and fetal distress. The diagnosis of amniotic fluid embolism is usually based on observing the typical clinical picture. Fetal squamous cells in a wedged pulmonary capillary aspirate have been used to confirm the diagnosis but are not specific. The differential diagnoses include septic shock, pulmonary thromboembolism, ruptured placentae, tension pneumothorax, and myocardial ischemia. Treatment involves routine resuscitative and supportive measures with prompt attention to adequate oxygenation, ventilation, and inotropic support. No specific therapy has been shown to be effective, although corticosteroids have been suggested. The survivors develop complications of disseminated intravascular coagulation, acute respiratory distress syndrome (ARDS), or both. Beta-adrenergic agonists, particularly ritodrine and terbutaline, are used to inhibit uterine contractions and preterm labor. These might cause pulmonary edema during pregnancy. The frequency varies from 0.3-9%. Mechanisms include prolonged exposure to catecholamines (which causes myocardial dysfunction), increased capillary permeability, and a large volume of intravenous fluid that may have been administered in response to maternal tachycardia. Glucocorticoids administered in preterm labor can also contribute to fluid retention. The clinical presentation is that of acute respiratory distress with features of pulmonary edema. The diagnosis is clinical, made in an appropriate clinical situation. The differential diagnoses include cardiogenic pulmonary edema, amniotic fluid embolisms, and aspiration pneumonia. Beta-agonist therapy must be discontinued; pulmonary edema usually resolves rapidly. The additional treatment is supportive and includes diuresis. Pulmonary edema may rarely occur in association with preeclampsia (approximately 3% of all patients with preeclampsia). Patients with preeclampsia are usually volume depleted, and pulmonary edema most commonly occurs in the early postpartum period and is often associated with aggressive fluid replacement. Reduced albumin concentration and myocardial dysfunction contribute to edema formation. The presentation is of acute respiratory distress in a patient with preeclampsia. Preeclampsia is characterized by hypertension, proteinuria, and peripheral edema, usually in the third trimester. The standard approach is to restrict fluid and administer supplemental oxygen and diuresis. Invasive monitoring might be useful if inotropic vasodilator therapy becomes necessary. Cardiogenic pulmonary edema is an important consideration in the differential diagnosis of acute respiratory failure in pregnancy. Cardiac failure can occur in the absence of preexisting heart disease as a result of hypertensive disease of pregnancy and peripartum cardiomyopathy. This idiopathic condition presents during the last month of pregnancy or during the postpartum period and is associated with significant mortality. During labor and early postpartum, tachycardia and increased cardiac output can precipitate pulmonary edema. Pulmonary hypertension and pulmonary edema can complicate benign hydatidiform pregnancy due to trophoblastic pulmonary embolism (PE). This commonly occurs during evacuation of the uterus, and the incidence of pulmonary complications is higher in later gestations. Molar pregnancy can also be associated with the development of choriocarcinoma, which commonly produces multiple discrete pulmonary metastases and occasional pleural effusions. Asthma is one of the most common coexisting medical conditions affecting reproductive-aged woman. The course of asthma during pregnancy is variable; one third of patients improve, one third remain stable, and one third worsen. In patients with symptomatic asthma, gestational weeks 24-36 tend to be the most difficult. Only 10% of women experience asthma exacerbation during labor and delivery, and the severity tends to revert to that of pregnancy by 3 months' postpartum. Asthma is generally expected to follow a similar course during successive pregnancies. A summary of observations during the 20th century suggests that infant outcome might be worse as asthma severity increases and that outcome with aggressive asthma management is usually good. Clinical features of asthma during pregnancy are the same as those in the nonpregnant patient. Objective assessment with pulmonary function tests is essential to assess the presence of airflow obstruction. For excellent patient education resources, visit eMedicineHealth's Asthma Center. Also, see eMedicineHealth's patient education articles Asthma and Asthma in Pregnancy. Asthma can be triggered by several factors, including allergy, upper respiratory tract infection, sinusitis, exercise, aspirin, nonsteroidal anti-inflammatory agents, and irritants (eg, tobacco smoke, chemical fumes, humidity, emotional upset). Paying close attention to asthma triggers might improve symptom control, and pregnant patients with asthma might require less medication. Strongly encourage smoking cessation in patients with asthma or in any pregnant patient. Gastroesophageal reflux is commonly recognized as an asthma trigger, and approximately one third of pregnant woman have symptomatic reflux. Initial therapy might consist of small meals and raising the head of the bed by 6 inches. Some patients might require antacids or H2-receptor–blocking medications. While a natural reluctance exists to prescribe drug therapy in pregnancy, poorly controlled asthma is potentially more dangerous for the fetus than medication. The classic teratogenic period in humans occurs from 4-10 weeks after the last menstrual period. Medications are added in a sequential fashion, with few differences from the nonpregnant patient. A stepped approach to asthma therapy generally is used. In outpatient asthma management, beta-2 agonists are used for symptomatic benefit. 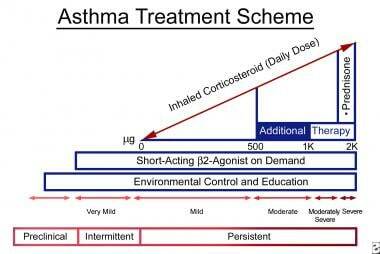 Inhaled corticosteroids remain the mainstay of therapy for asthma control. Initiate treatment with the lowest possible dose of inhaled steroids; the dose can be increased further as required by symptomatic and objective asthma assessment. Long-acting adrenergic agonists, such as salmeterol or formoterol, might be used in symptomatic patients on adequate corticosteroid therapy. The leukotriene antagonists are the newest agents available for asthma management. Their exact role in the treatment of asthma during pregnancy is unclear. No widespread experience has been gained with the use of these agents in pregnant patients. Theophylline might be used as a third-line agent after beta-agonist therapy and inhaled steroids. Extensive experience has been gained with the use of theophylline during pregnancy, and it does not appear to cause developmental risk. Asthma can have a number of deleterious effects on pregnancy outcome. An increased incidence of preterm births, low birth weight, and increased prenatal mortality largely related to poor asthma control has been reported. Physicians and patients should not inappropriately avoid the use of effective pharmacologic therapy because of concerns for fetal effects of drugs. Acute exacerbations that necessitate emergency department visits typically require a course of systemic corticosteroids. Oxygen should be used liberally, and the oxygen saturation should be maintained at or above 95% to ensure fetal well-being. A beta-agonist with or without ipratropium should be given via a metered-dose inhaler with a spacer or in nebulized form. Theophylline has limited use in acute exacerbations. Aggressive management of asthma exacerbation is recommended because of greater risk to the fetus from untreated asthma. VTE is approximately 5 times more common in pregnant women compared to nonpregnant women of similar age. The most constant predisposing factor is increased venous stasis. The physiologic changes of pregnancy result in increased venous distensibility and capacitance, which are evident in the first trimester. Other factors that contribute to VTE are cesarean delivery, advanced maternal age, prolonged bed rest, hemorrhage, sepsis, multiparity, and obesity. Coagulation factors II, VII, and X increase appreciably by mid pregnancy. Fibrin generation increases as protein S levels decrease. Protein C levels are unchanged; the fibrinolytic system is inhibited, particularly in the third trimester. Activated protein C resistance increases the risk of VTE 30- to 50-fold in heterozygotes and several hundred–fold in homozygotes. Other inherited and acquired factors also increase the risk of VTE. Venography is considered the criterion standard but is difficult to perform and interpret and might cause appreciable pain in the foot and calf or hypersensitivity reactions. Increasingly, noninvasive studies have replaced venography. Real-time B-mode ultrasonography is the mainstay of objective testing. The most reliable ultrasound criterion for thrombosis is a failure to collapse the vascular lumen completely with gentle probe pressure. The sensitivity for duplex ultrasound for proximal thrombi is approximately 95%, and the specificity is 99%. False-positive test results can occur during pregnancy or in pelvic tumors. Ultrasonography is less sensitive for helping identify calf vein thrombosis. In many large series, impedance plethysmography (IPG) has an accumulated sensitivity of 95% and specificity of 96%. Signs and symptoms of PE are more problematic because dyspnea and tachypnea are common in pregnancy. In nonpregnant patients, tachypnea, dyspnea, chest pain (pleuritic), apprehension, and crackles are present in at least 50% of patients. Chest radiographs are abnormal in 80% or more of patients with PE, and the findings are nonspecific. Electrocardiogram findings are abnormal in 70% of patients with PE but are nonspecific. Arterial oxygen tension is low in the majority of patients with PE. As with DVT, PE requires objective diagnostic testing to confidently confirm or exclude the diagnosis. This is particularly true in pregnancies because the diagnosis of DVT or PE requires (1) prolonged therapy (≤9 mo of heparin during pregnancy), (2) prophylaxis during future pregnancies, and (3) avoidance of oral contraceptive pills. The first objective diagnostic test should be compression ultrasonography; if it is not available, IPG is adequate. If the findings from noninvasive leg studies are negative, then proceed to ventilation-perfusion lung scanning. Perfusion scanning alone is recommended initially, and the ventilation scan is added when perfusion defects are noted. Pulmonary angiography might be necessary if lung scan findings are of low probability or indeterminate and clinical suspicion remains high. Several studies show no increased risk of teratogenicity in patients undergoing radiological procedures in the diagnosis of maternal venous thromboembolic disease. A complete and adequate evaluation to document the presence or absence of PE requires less than 0.005 Gy. Obtaining the appropriate diagnostic study in pregnancies is mandatory. Patients, whether pregnant or not, in whom PE is strongly considered should be treated immediately with intravenous unfractionated heparin unless a high risk or contraindication is present for the use of any anticoagulants. Extensive clinical experience and cohort studies establish heparin as the safest anticoagulant to use during pregnancy because it does not cross the placenta. The initial loading should be 5000-10,000 units. Following loading, an infusion of 18 U/kg should be started. The patient's activated partial thromboplastin time should be monitored and kept in the therapeutic range, which is 1.5-2 times the baseline value. Although only a relatively modest amount of data have been gathered, low molecular weight heparin, which does not cross the placenta, can be given once a day and does not require monitoring. Low molecular weight heparin has not been shown to increase the risk of bleeding with surgical procedures, including cesarian delivery, in a small number of patients. Warfarin should be avoided throughout pregnancy. It can result in embryopathy characterized by mental retardation, optic atrophy, cleft lip, cleft palate, and cataracts in addition to hemorrhage. The teratogenic effects are particularly common during the first trimester. Warfarin crosses the placenta; it can cause fetal and neonatal hemorrhage and placental abruption. Patients who sustain a DVT or PE antepartum should receive anticoagulation therapy with heparin throughout the pregnancy. After delivery, warfarin should be started; the heparin can be discontinued once an adequate International Normalized Ratio is achieved. Warfarin should be continued for at least 6 weeks postpartum or until at least 3 months of anticoagulant therapy have been completed. Osteopenia has been reported with unfractionated heparin administered for more than 6 months. No information is available about the beneficial effects of concomitant multivitamins, calcium, or vitamin D supplementation. The problem of osteopenia and osteoporosis might be less with low molecular weight heparin, but providing optimum calcium and vitamin D supplementation is reasonable for all patients receiving long-term heparin administration during pregnancy. In women with a history of VTE during pregnancy, the recurrence rate in a subsequent pregnancy has been estimated to be 4-15%. Women with a known hypercoagulable state are also at increased risk of VTE during pregnancy and should receive prophylaxis. Effective prophylaxis has been demonstrated with unfractionated heparin administered twice daily with an average daily dose of 16,400 IU/d or 225 IU/kg of body weight per 24 hours. The amount of heparin required for adequate prophylaxis might increase through the second and third trimester. Therefore, heparin should be adjusted to midinterval plasma heparin levels of 0.05-0.25 U/mL, measured as factor Xa activity. Low molecular weight heparin is most appropriate for prophylaxis because it requires a single daily dose, does not require laboratory monitoring, and may be associated with a lower risk of osteoporosis and bleeding. Pneumonia is an infrequent, yet serious, complication of pregnancy and is the most frequent cause of nonobstetric infection and the third most frequent cause of indirect obstetric death. The incidence of pneumonia varies widely, with 1 episode occurring in every 1287 deliveries. Although pneumonia can occur any time during gestation, the presence of pneumonia in the third trimester is associated with preterm labor. Most poor fetal outcomes occur in mothers with underlying comorbid illnesses such as chronic respiratory disease. Virtually any infectious agent can cause pneumonia in a pregnant patient. Streptococcus pneumoniae is the most common pathogen. Other agents are Mycoplasma pneumoniae, Haemophilus influenzae, and Legionella species. Influenza and other viruses also cause pneumonia. The clinical features of acute bacterial pneumonia in pregnant women are no different from those in nonpregnant patients. A history of preceding upper respiratory tract infection, cough, fever, dyspnea, and chills is present. The pneumonia might be unilobar or multilobar. A delay in recognition might lead to the development of complications of pneumonia, such as respiratory failure or empyema. In bacterial pneumonia, the antibiotics that are safe in a pregnant patient are penicillins, cephalosporins, and macrolides. Clindamycin probably also is a safe agent. The penicillins are only 50% protein-bound and do not cross the placenta to achieve a high fetal concentration; the cephalosporins cross the placenta less effectively. Viral pneumonia or fungal pneumonia also might be observed in pregnant patients. Influenza has an acute onset after an incubation of 1-4 days and presents as high fever, headache, malaise, and cough. Viral and fungal pneumonia are often complicated by a secondary bacterial pneumonia. Varicella pneumonia is a serious respiratory tract infection that can lead to high maternal mortality. This should be treated with acyclovir. Pneumonia complicating HIV infection in pregnancy is increasingly encountered. Pneumocystis carinii pneumonia should be considered in this patient group. The use of new proteinase inhibitors reduces the viral burden and vertical transmission of HIV. Patients with P carinii pneumonia require treatment with trimethoprim-sulfamethoxazole with folate supplementation. More than 8 million cases of tuberculosis occur in the world every year, and most of these occur in young adults; therefore, reproductive-aged women are at significant risk for both tuberculosis infection and disease. With prompt diagnosis and early institution of proper therapy, a good outcome for the mother and child will occur. Many pregnant patients are good candidates for screening for tuberculosis infection, and some should receive preventative therapy before delivery. Active tuberculosis in pregnancy should be aggressively investigated and must always be treated. HIV infection and drug-resistant tuberculosis present special challenges in pregnancy. Knowledge of drug interactions and teratogenic effects of antiretrovirals and second-line antituberculosis agents is needed to treat these patients properly. Tuberculosis in pregnancy is usually treated with isoniazid and rifampin. Ethambutol may be added initially until sensitivities are available. These drugs may cross the placental barrier, but they are associated with a low risk of adverse fetal effects. Streptomycin and other injectable antituberculous drugs are contraindicated because of fetal toxicity and potential teratogenic effects. Pregnant patients are at risk of developing ARDS from obstetric complications and from nonobstetric conditions. Obstetric complications, such as amniotic fluid embolism, chorioamnionitis, trophoblastic embolism, and placental abruption, can produce acute lung injury. Pregnancy predisposes the patient to other pulmonary insults that can cause ARDS, such as gastric aspiration, pneumonia, air embolism, and massive hemorrhage. An association between pyelonephritis and the development of ARDS has been described in pregnancy. The mechanism is unclear, but iatrogenic factors, such as excessive fluid administration and tocolytic therapy, might be responsible. The reduced albumin level and resultant reduced plasma oncotic pressure occurring in pregnancy lowers the critical pulmonary capillary pressure at which pulmonary edema develops. No major differences exist in the management of the pregnant and nonpregnant patient with ARDS. Fetal risk must be considered when pharmacological therapy is administered. Adequate maternal oxygen saturation is essential for fetal well-being. Excessive alkalosis can have adverse effects on placental perfusion, while maternal acidosis appears to be reasonably well tolerated by the fetus. Survival appears similar to ARDS in the general population. While pleural effusions can accompany obstetric complications such as preeclampsia, a significant proportion of women develop asymptomatic pleural effusion in the postpartum period. The increased blood volume and reduced colloid osmotic pressure that occur in pregnancy and the impaired lymphatic drainage due to Valsalva maneuvers during pregnancy cause pleural effusion. Moderately sized effusions or the presence of symptoms should prompt a full clinical evaluation. Most interstitial lung diseases are not commonly associated with pregnancy. Interstitial lung disease might reduce arterial oxygen saturation because of the gas transfer defect. Restrictive lung disease appears to be well tolerated in pregnancy, although little data exist on management strategies. Some conditions, such as lymphangioleiomyomatosis and systemic lupus erythematosus, can deteriorate significantly during pregnancy. Advances in the management of patients with cystic fibrosis have extended life expectancy into the childbearing age. Although fertility might be somewhat compromised, contraception and planned pregnancy should be considered when treating these patients. Available data indicate that pregnancy does not increase mortality in patients with stable disease compared to matched nonpregnant patients with cystic fibrosis, but poor outcomes can occur in patients with advanced disease. Patients with a prepregnancy forced vital capacity of less than 50% predicted or pulmonary hypertension are at greatest risk. Perinatal mortality is increased, largely due to preterm delivery or the maternal complications of cystic fibrosis. The treatment of these patients requires a multidisciplinary team with careful attention to nutrition, glucose monitoring, and genetic counseling. Respiratory exacerbation requires early aggressive therapy, keeping in mind the fetal toxicity of antibiotics, such as aminoglycosides and quinolones, and altered maternal pharmacokinetics. Sleep complaints are very common among pregnant women; however, limited polysomnographic recordings are available that systematically investigate the causes of these complaints. Reports suggest that pregnancy may precipitate or worsen sleep apnea. One study looking at eight obese snoring pregnant women with a clinical diagnosis of sleep apnea found intrauterine growth retardation in all cases, but others have reported good fetal outcome. Pregnancy, if complicated by obstructive sleep apnea, is associated with potential adverse effects for both the mother and the fetus. Snoring alone is not associated with fetal risk. In general, apnea and hypopnea are uncommon in pregnancy because of the respiratory stimulatory effect of progesterone. Nocturnal hypoxemia might adversely affect the fetus and poor fetal growth has been documented in patients with this condition. Treatment with nasal continuous positive pressure should be instituted after appropriate investigations, such as polysomnographic studies, are performed. Guilleminault et al investigated the tolerance, compliance, and problems associated with the usage of nasal continuous positive airway pressure (CPAP) by pregnant women with sleep disordered breathing. Twelve pregnant women diagnosed with sleep disordered breathing received polysomnography at entry, CPAP titration, and repeat polysomnography at 6 months. All of the subjects had full-term pregnancies and healthy infants. Nasal CPAP is a safe and effective treatment of sleep disordered breathing during pregnancy. Garcia-Rio F, Pino JM, Gomez L, Alvarez-Sala R, Villasante C, Villamor J. Regulation of breathing and perception of dyspnea in healthy pregnant women. Chest. 1996 Aug. 110(2):446-53. [Medline]. Garne E, Vinkel Hansen A, Morris J, Jordan S, Klungsøyr K, Engeland A, et al. Risk of congenital anomalies after exposure to asthma medication in the first trimester of pregnancy - a cohort linkage study. BJOG. 2016 Sep. 123 (10):1609-18. [Medline]. Clark SL, Hankins GD, Dudley DA, Dildy GA, Porter TF. Amniotic fluid embolism: analysis of the national registry. Am J Obstet Gynecol. 1995 Apr. 172(4 Pt 1):1158-67; discussion 1167-9. [Medline]. Pisani RJ, Rosenow EC 3rd. Pulmonary edema associated with tocolytic therapy. Ann Intern Med. 1989 May 1. 110(9):714-8. [Medline]. Sibai BM, Mabie BC, Harvey CJ, Gonzalez AR. Pulmonary edema in severe preeclampsia-eclampsia: analysis of thirty-seven consecutive cases. Am J Obstet Gynecol. 1987 May. 156(5):1174-9. [Medline]. Murphy VE, Clifton VL, Gibson PG. Asthma exacerbations during pregnancy: incidence and association with adverse pregnancy outcomes. Thorax. 2006 Feb. 61(2):169-76. [Medline]. Schatz M, Dombrowski MP, Wise R, Momirova V, Landon M, Mabie W. Spirometry is related to perinatal outcomes in pregnant women with asthma. Am J Obstet Gynecol. 2006 Jan. 194(1):120-6. [Medline]. Carroll KN, Griffin MR, Gebretsadik T, Shintani A, Mitchel E, Hartert TV. Racial differences in asthma morbidity during pregnancy. Obstet Gynecol. 2005 Jul. 106(1):66-72. [Medline]. Cockcroft DW. Treatment of asthma during pregnancy. Ann Allergy Asthma Immunol. 2005 Sep. 95(3):213-4. [Medline]. Liccardi G, Cazzola M, Canonica GW, D'Amato M, D'Amato G, Passalacqua G. General strategy for the management of bronchial asthma in pregnancy. Respir Med. 2003 Jul. 97(7):778-89. [Medline]. [Guideline] National Asthma Education and Prevention Program. Managing asthma during pregnancy: recommendations for pharmacologic treatment. National Guideline Clearinghouse. 2005 Jan.
Bakhireva LN, Jones KL, Schatz M, Johnson D, Chambers CD. Asthma medication use in pregnancy and fetal growth. J Allergy Clin Immunol. 2005 Sep. 116(3):503-9. [Medline]. Murphy VE, Gibson P, Talbot PI, Clifton VL. Severe asthma exacerbations during pregnancy. Obstet Gynecol. 2005 Nov. 106(5 Pt 1):1046-54. [Medline]. Girling JC, de Swiet M. Thromboembolism in pregnancy: an overview. Curr Opin Obstet Gynecol. 1996 Dec. 8(6):458-63. [Medline]. Practice bulletin no. 123: thromboembolism in pregnancy. Obstet Gynecol. 2011 Sep. 118(3):718-29. [Medline]. Liu S, Rouleau J, Joseph KS, et al. Epidemiology of pregnancy-associated venous thromboembolism: a population-based study in Canada. J Obstet Gynaecol Can. 2009 Jul. 31(7):611-20. [Medline]. Chen YH, Keller J, Wang IT, Lin CC, Lin HC. Pneumonia and Pregnancy Outcomes: A Nationwide Population-based Study. Abstract at: http://www.ajog.org/article/S0002-9378(12)00902-7/abstract. Amer J Obstet Gynecol. Aug 2012. in press. Frangolias DD, Nakielna EM, Wilcox PG. Pregnancy and cystic fibrosis: a case-controlled study. Chest. 1997 Apr. 111(4):963-9. [Medline]. Paternoster DM, Pascoli I, Parotto M, et al. Pulmonary hypertension during pregnancy: management of two cases. Arch Gynecol Obstet. 2009 Aug 12. [Medline]. Streit M, Speich R, Fischler M, Ulrich S. Successful pregnancy in pulmonary arterial hypertension associated with systemic lupus erythematosus: a case report. J Med Case Reports. 2009 Jun 9. 3:7255. [Medline]. [Full Text]. Pien GW, Schwab RJ. Sleep disorders during pregnancy. Sleep. 2004 Nov 1. 27(7):1405-17. [Medline]. Guilleminault C, Kreutzer M, Chang JL. Pregnancy, sleep disordered breathing and treatment with nasal continuous positive airway pressure. Sleep Med. 2004 Jan. 5(1):43-51. [Medline]. [Guideline] Clark SL. Asthma in pregnancy. National Asthma Education Program Working Group on Asthma and Pregnancy. National Institutes of Health, National Heart, Lung and Blood Institute. Obstet Gynecol. 1993 Dec. 82(6):1036-40. [Medline]. Contreras G, Gutierrez M, Beroiza T, et al. Ventilatory drive and respiratory muscle function in pregnancy. Am Rev Respir Dis. 1991 Oct. 144(4):837-41. [Medline]. Cydulka RK, Emerman CL, Schreiber D, Molander KH, Woodruff PG, Camargo CA Jr. Acute asthma among pregnant women presenting to the emergency department. Am J Respir Crit Care Med. 1999 Sep. 160(3):887-92. [Medline]. Douketis JD, Ginsberg JS. Diagnostic problems with venous thromboembolic disease in pregnancy. Haemostasis. 1995 Jan-Apr. 25(1-2):58-71. [Medline]. Ginsberg JS, Hirsh J, Rainbow AJ, Coates G. Risks to the fetus of radiologic procedures used in the diagnosis of maternal venous thromboembolic disease. Thromb Haemost. 1989 Apr 25. 61(2):189-96. [Medline]. King TE Jr. Restrictive lung disease in pregnancy. Clin Chest Med. 1992 Dec. 13(4):607-22. [Medline]. Laibl VR, Sheffield JS. Influenza and pneumonia in pregnancy. Clin Perinatol. 2005 Sep. 32(3):727-38. [Medline]. Lehmann V. Dyspnea in pregnancy. J Perinat Med. 1975. 3(3):154-60. [Medline]. Maasilta P, Bachour A, Teramo K, Polo O, Laitinen LA. Sleep-related disordered breathing during pregnancy in obese women. Chest. 2001 Nov. 120(5):1448-54. [Medline]. Mabry RL. Rhinitis of pregnancy. South Med J. 1986 Aug. 79(8):965-71. [Medline]. Toglia MR, Weg JG. Venous thromboembolism during pregnancy. N Engl J Med. 1996 Jul 11. 335(2):108-14. [Medline]. White RJ, Coutts II, Gibbs CJ, MacIntyre C. A prospective study of asthma during pregnancy and the puerperium. Respir Med. 1989 Mar. 83(2):103-6. [Medline]. Ali Z, Hansen AV, Ulrik CS. Exacerbations of asthma during pregnancy: Impact on pregnancy complications and outcome. J Obstet Gynaecol. 2015 Oct 14. 1-7. [Medline]. Van Zutphen AR, Bell EM, Browne ML, Lin S, Lin AE, Druschel CM, et al. Maternal asthma medication use during pregnancy and risk of congenital heart defects. Birth Defects Res A Clin Mol Teratol. 2015 Sep 26. [Medline]. Mehta N, Chen K, Hardy E, Powrie R. Respiratory disease in pregnancy. Best Pract Res Clin Obstet Gynaecol. 2015 Jul. 29 (5):598-611. [Medline].